On Saturday I got my first (and probably last!) taste of winning a race. 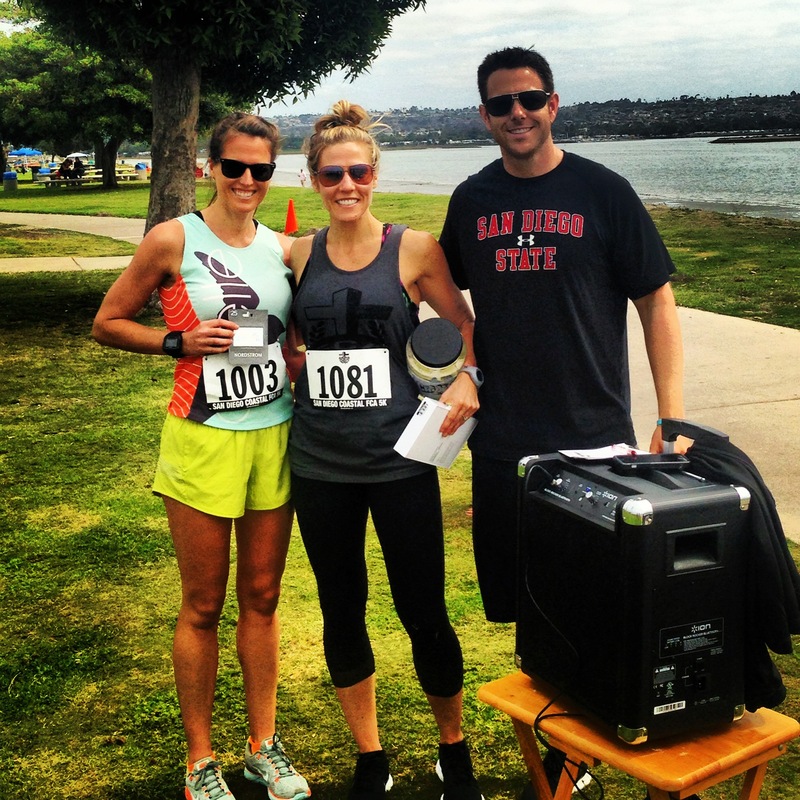 My good friend Allison and her husband put on a 5k along the beautiful San Diego Mission Bay to fundraise for Fellowship Christian Athletes, an incredible organization which encourages integrity, service, teamwork and excellence in student athletes through ministry. Allison’s husband Tim works for FCA and he has made an incredible impact on the lives of countless San Diego student athletes. 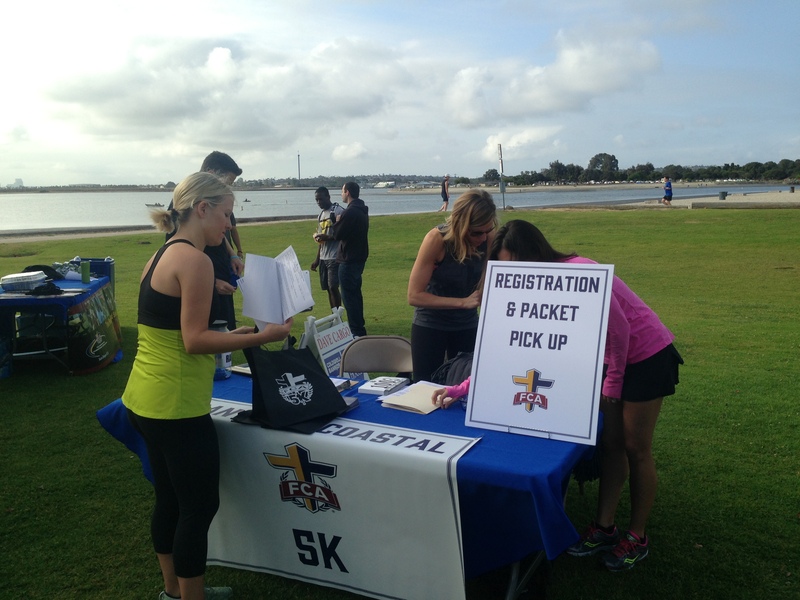 This inaugural 2014 FCA 5K was organized, funded executed by Tim, Allison and several generous volunteers and sponsors in order to support FCA’s mission. Needless to say, this was a small race. There wasn’t chip timing and there was no need for waves. It was about having fun and raising money for a good cause. First place prizes were donated for the first place man, woman, female student athlete and male student athlete. Regardless of the prize, I was planning running hard. It had been about three years since I raced a 5k (our post wedding 5k was my last 3.1 mile run and I wouldn’t exactly call it a race!) and I wanted to see what I had under the hood. However, I haven’t been training for a 5k, I didn’t necessarily taper for it (although it was recovery week last week!) and I didn’t have any plans for the race other than to run hard and see what happened. Days before the race I went to my old friend McMillan and typed in my BQ time and my goal half marathon time to see what I “should” be able to race a 5k at. I decided I wanted to run it somewhere in the 21s based on this research. The first thing I thought when I saw the first 5k time McMillan said I “should “ be able to run for my half marathon goal was that it was impossible. The time started with an average pace in the 6s. Very high 6s, but I had a mental block. Have I EVER run a mile in the 6s, let alone 3.1? I’m possible. Had it said 7:05 average, I probably wouldn’t have scoffed. Funny how the mind creates a mental block at nice round numbers like 7:00 min/miles, 2 hours, etc. Once we cross that threshold, it takes a while to imagine running into the next group of times 6:00 min/miles, sub 1:50, etc. 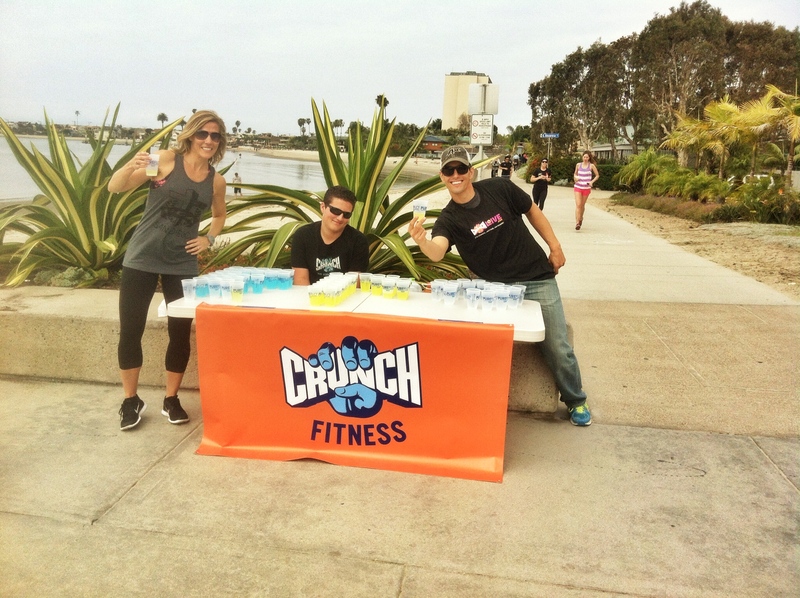 Mike volunteered to work the Crunch Gym sponsored aid station which was at the turn around point. The race started at 9 a.m. and it was already a beautiful, sunny and warm morning when we arrived around 8 a.m. Allison was just arriving from setting up the aid station and I signed in, got my bib and chatted with other participants. At around 8:30 I drove Mike to the aid station and left him with our car keys and then ran the 1.55 miles back to the start as my warm-up. Once I got there, some of my old coworkers were there and I got to catch up with them. Before we knew it, announcements were made and the we were starting the race. I lined up right in front and as soon as they said GO I was off! I started off way too fast (surprise surprise). There were 5 or so high school boys in the front and they took off super-fast, probably in the low 5s since I was running in the mid to low 6s! I knew I had a tailwind at this point and I was feeling good but I knew I should slow down a bit so I did. Despite a lack of nerves before the race, my adrenaline definitely kicked up at the start. Greg, an old coworker of mine, ran right next to me and said I would pace him. We ran side by side in silence. Once we passed under a bridge and changed direction on the bay we were now running into a headwind and things started to feel harder. My pace dropped a bit and I really, really wanted my first mile to have a 6 in front of it so I was disappointed when my watch beeped and out came a 7:00 FLAT! Haha. Oh well. I kept it steady until the turnaround point. My legs felt heavy and breathing was hard but not maxed out. The fatigue from the previous weeks of hard work was still lingering in my legs. I made it to the turnaround point was excited o see Mike was there cheering us on and I gave him a high five (didn’t take any water). Greg stopped and grabbed water and once he got back up to me he sped past me. I had slowed down and was now running in the mid 7s and it felt hard! Since it was an out and back I was now running past all the other runners. Many shouted words of encouragement and a few said I was winning or the first woman which was fun! It boosted my spirits. I made a goal to pick it up once I hit the 2nd mile marker. Once I did, I tried to go faster but my legs just wouldn’t let me! Without the competition of a big race and crowd, it was difficult to get motivated to push even harder. I let myself slow a bit but was still working hard. It wasn’t until I went under the bridge and was heading back to the finish did I really pick it up for a solid finish. Tim was announcing and he called my name as the winner! It was pretty exciting to win! I was a little disappointed in my final time – 22:35 (7:11 pace since I overran the course as usual) but proud that I won and it was still nearly a 1.5 minute PR! I chatted with Greg and cheered in runners as they came in and once everyone was finished, we had the awards ceremony I was presented with a Nordstrom gift card! 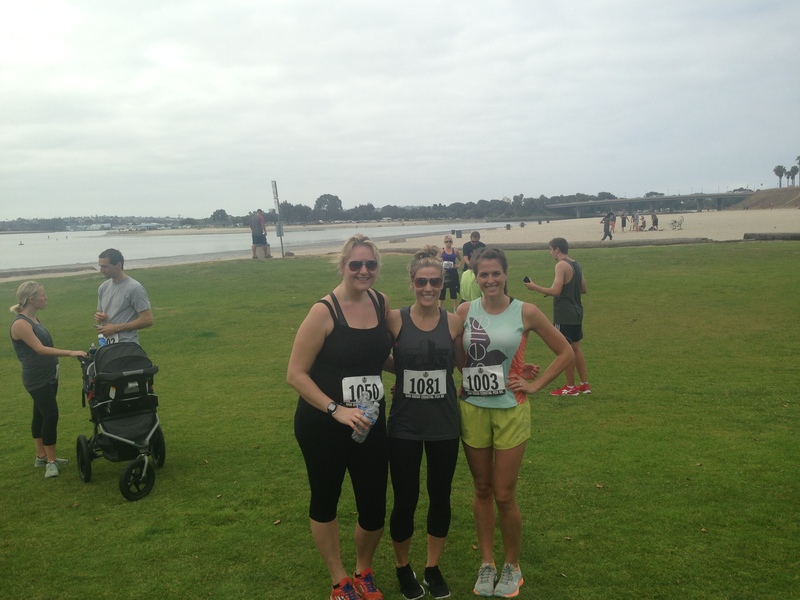 It was definitely fun to run a 5k and it also reminded me that a shorter race doesn’t necessarily mean less pain! I think I’m built for longer distances but it’s still fun to see what I can do on a shorter course. Plus, it was all for a great cause! Icing on the cake. Do you like to run 5ks? « Spring Training Week 4 – Recovery Week! Woohoo!! Congrats on the win and PR!!! I’m 100% positive you can break 22 if you go out a bit slower. I would 100% like to break 22 myself with that same advice. Lol! That’s awesome you won, and that you got an great PR!! Congratulations! Small races are fun to have more space, support a good cause, and boost your confidence! 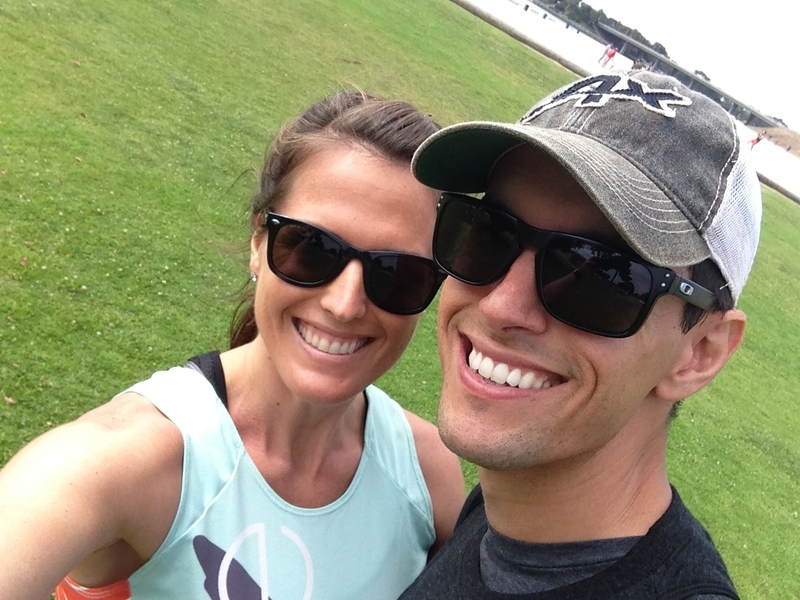 I haven’t run a 5k in years (I think since our honeymoon over six years ago)! My 5k PR is from training runs! I’m definitely built for endurance, too, but it’s fun to do shorter races once in a while. I wanted to do a 5k next weekend, but I just don’t trust my leg to try running fast. You are awesome and I am SO proud of your win!! Thanks for the even shout out and support! We were stoked you ran our race and now you have a title to uphold!! Congrats on your win! I really like 5Ks. They are brutally hard but over quickly. I’m running one in May to pace an elementary student who I’ve signed up to mentor and then one in June that ends inside the Braves stadium at their home dugout. Excited for both! Good job on your race. Thank you! I really want to run another one soon to see what I’ve got! Although they are brutally painful like you said! Congrats!! So awesome that you won!! and a PR too!!! I totally get what you mean about the mental block for a faster time!! How nice to win. I’m not super speedy, but I like when I can place in the age groups (and so yes, my coach sometimes calls me “My age grouper athlete” which makes me want to vomit, but I sure am not elite.). I do not particularly like 5K’s because they are kind of a precise race. If in a half or a full marathon, an error in pacing is made, if recognized quickly it can usually be “fixed” but boy in a 5K…mess up the pacing and it’s toast. Good Luck with your BQ goal.